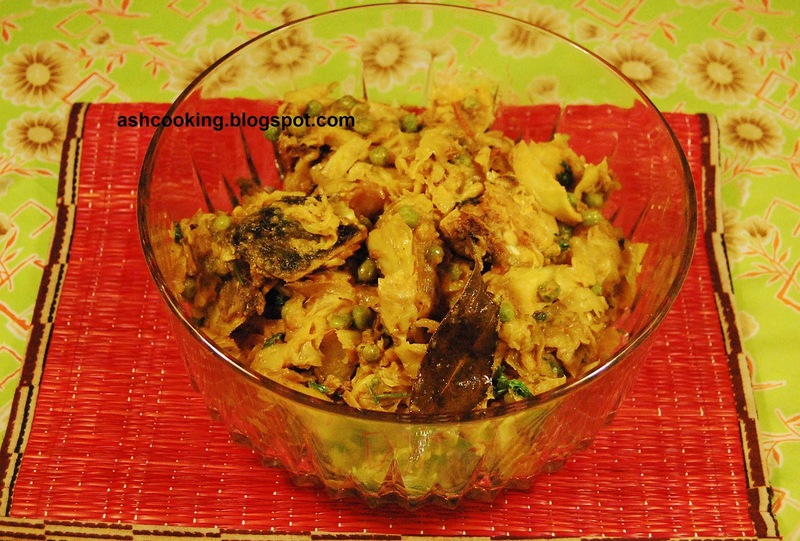 Dry Cabbage Curry with Rohu fish head, a traditional delicacy in Bengal is cooked very rich with an array of spices and dollops of ghee boosting the flavour. The heady aroma pervading each corner of your home while the dish is in making might bring in the next door neighbour knocking at your door inquiring of the menu for the day, the all-pervasive savour announcing of a grand feasting. 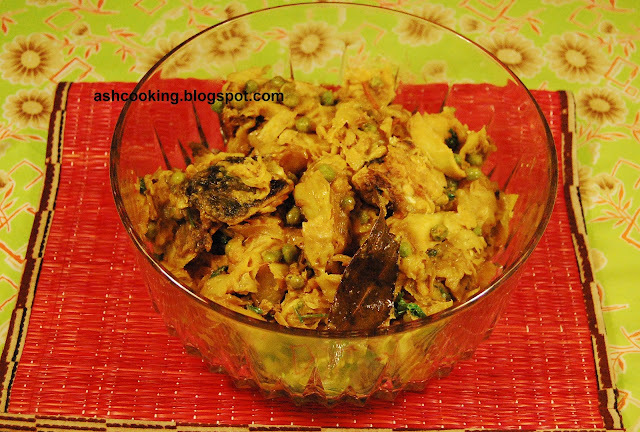 Known best as an accompaniment to Bhoger Khichuri, this cabbage preparation is relished in every household of Bengal. Both my mother and mother in law with their magical touch of love cook this curry bringing out a mouth-watering taste that an entire plate of rice can be consumed only with this dish by the side; one simply doesn't need anything else. 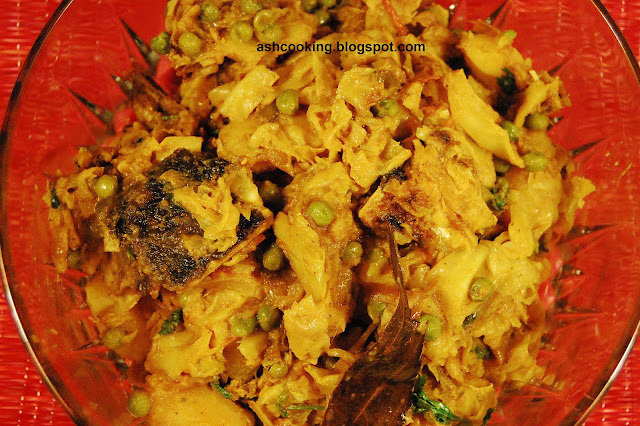 Immediately after marriage when I was not very comfortable with cooking, for the most part relying on the cook for every small meal, I often wondered why only rohu fish is to be added in cooking this cabbage curry. So twice, out of sheer curiosity, I switched the rofu fish head with that of hilsa and bhetki and the turnout came nowhere near to the one cooked with rohu. 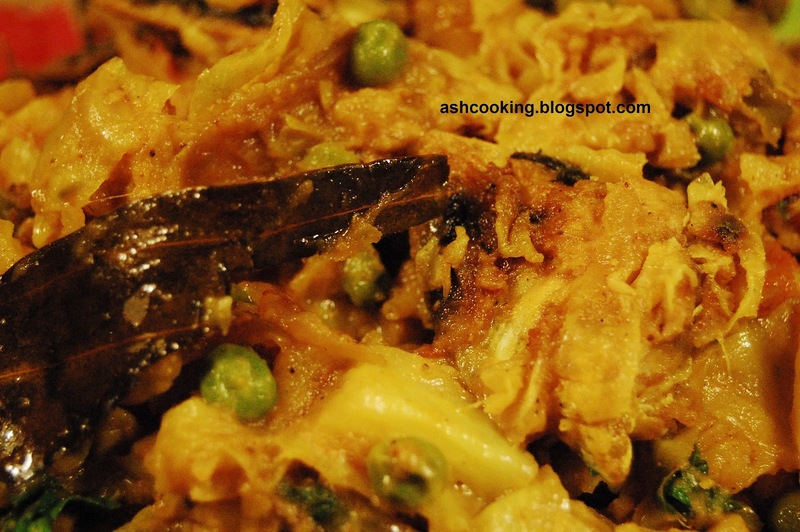 With the twin failures of my experimentation, I finally dropped the idea having stuck to the traditional way of cooking the cabbage with rohu fish head only from the next time on. Thenceforth, I never made any attempt at distorting the traditional recipes. 1) Pressure-cook the cabbage in 2 cups of water with a sprinkling of turmeric powder till one whistle on high flame. Turn off the heat and release the steam out by holding a spoon under the pressure cooker regulator or you can do the same by placing the pressure cooker under running water till all the steams escape and the lid opens smoothly. 2) Next strain the cabbage through a sieve and dispose the water. 3) Heat generous amount of mustard oil in a wok. When oil turns smoking hot, add the fish head and fry till brown in color. Take the fish head off the flame and break it into few parts. 4) Into the same oil, toss in the potato cubes and fry till they change into golden brown in color. Keep aside. 5) Into the same oil, add the ingredients for sauté and allow them to crackle. Add onion and fry till onion changes color. 5) Add 1 tsp sugar and tomatoes and shallow fry till tomatoes soften. Add ginger paste, green chillies, turmeric powder, kashmiri red mirch, cumin powder and coriander powder. Sauté the spices for 5-8 minutes till they blend into a nice flavour. 7) Sprinkle garam masala powder and ghee. Mix in. Add green peas and fish head pieces. Combine all and cook for 2 more minutes before turning the heat off. 8) Garnish with coriander leaves and serve hot with rice, roti or chapati.